Intel Curie, A Ring-Sized Smart Wearable Platform! 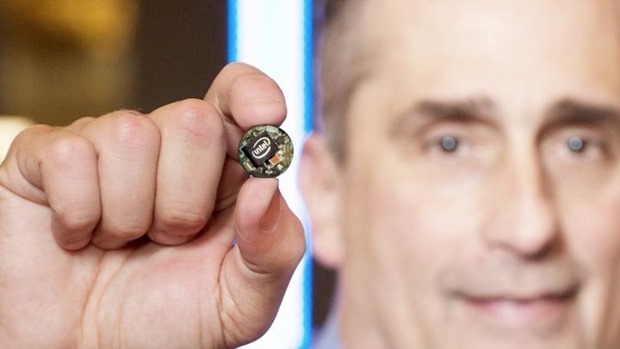 Intel has announced a new wearable platform Curie that can fits in a coat button. In fact that’s what, Intel CEO, Brian Krzanich , did when he showcased this board at CES this year. He removed a coat button and turn it around. And there it was, a full System in a chip curie board. Intel curie is a low-power hardware module that could be used to build wearables out of things like rings, bags, pendants, or glasses. Measuring just 18 mm across, it packs a processor based on Quark SE architecture, 80 kb RAM, 384kb built in storage and Low Energy Bluetooth built in. 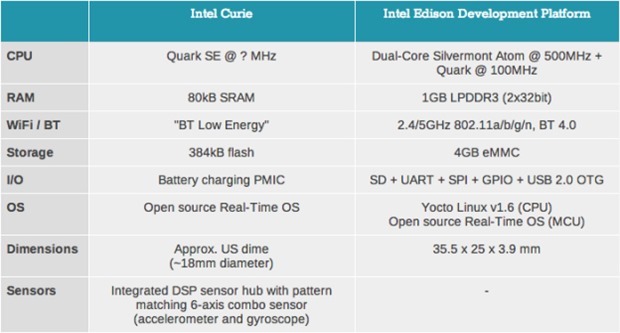 According to Intel, This is the first SOC purpose built for wearables and thus is designed to be power efficient. Unfortunately, this also means that the SOC lacks a dedicated application processor. Instead it relies on the Micro Controller Unit built in for all processing functionalities. The device it will power will not be as powerful as android powered watches like Galaxy Gear or Sony smart watch. Apart from this, the system also boasts a proprietary pattern matching accelerator for gesture recognition, six way combination accelerometer and gyroscope sensors. It has pretty much everything a wearable gadget needs including battery charging circuitry. Well, the sad news is that this will not be mass released for DIY/Developer community as of now. Instead, Intel will partner with the likes of Oakley, Nike, Fitbit and others to build portable fitness tracker devices. While unveiling the board, Intel also announced gadgets will be shipped in 3rd quarter of 2015. A separate SDK, Intel IQ software kit will be bundled with the board. I hope this platform is sold separately for the mass market. Being so small, feature packed and standalone, it will find many uses among the DIY / hacker community than if released for exclusive partnerships. Intel also released a portable PC at CES 2015 (our coverage of Day 1 and Day 2) that can fit the size of a gum stick. Running two variants one for Windows 8.1 and another running Linux, the Intel Compute Stick boosts near PC like specifications like 1.8 GHz atom processor, 2gb ram (1GB for Linux version), WiFi 802.11 b/g/n, Bluetooth 4,0 and a mix of USB and micro USB ports. These PC sticks are prices at $149 and $89 respectively set to be released in March. This will hopefully fill the market of a portable yet powerful PC that competes the likes of Google Chromecast and amazon fire TV stick. It is interesting to see how miniaturization of devices is happening, thanks to sudden consumer interest in wearables. The next year or two will definitely witness some wonderful things happening in wearables space, and Intel with it’s Curie wants to be in the thick of things! Pradyumna is a software quality consultant in BPM Software. He keenly follows Web & App ecosystem spaces and e-commerce news.